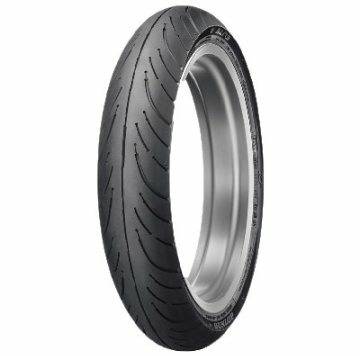 Mileage, mileage and more mileage: Dunlop’s all-new Elite 4 with MT Multi-Tread rear tires provide significantly more mileage than single-compound tires. All Elite 4 rear tires utilize Dunlop’s MT Multi-Tread technology with a long-wearing compound in the center of the tire and a lateral-grip compound on each shoulder, providing increased mileage without sacrificing handling. New tread pattern helps provide class-leading wet-pavement performance, even wear over the life of the tire, and less road noise. Available in radial and bias-ply construction, the Elite 4 fits hundreds of touring, cruiser and standard bikes, including current and non-current machines. High-mileage, even-wear characteristics, and great grip- the all-new Elite 4.